The effective Transformational Leader creates a culture of high performing leaders, just as the musical conductor creates a high performing ensemble. The leader, therefore must learn to manage self. Bowen Systems is basically about Differentiation of Self – managing self. This is the beginning of unblocking what we don’t know that might be limiting our effectiveness. Unblocking ourselves starts with knowing ourselves. This two-part session is about knowing self through the work of Murray Bowen, who created a very useful and relevant leadership system. Today’s session is part one of a two-part series focusing on what blocks leaders from success. There will be more around this topic. These two sessions, and the following interview with Dr. Roberta Gilbert, are about the work of Murray Bowen, a psychiatrist. 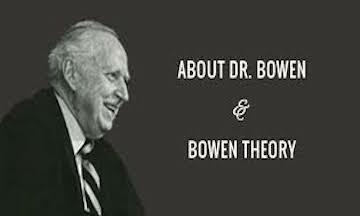 Murray Bowen had dedicated his life to the human cause, producing a remarkable new theory of human behavior: family systems theory, known as the Bowen theory. The new theory has potential to replace most of Freudian theory and to radically change treatment approaches, not only in psychiatry, but in all of medicine. 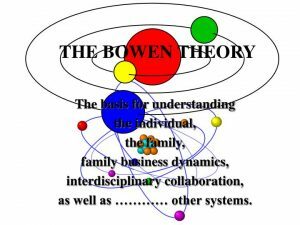 Potential applications of Bowen theory extend beyond the human family to non-family groups, including large organizations and society as a whole. I present this as a leadership concept. I am not presenting this as a psychiatrist or psychologist; I am presenting this as leadership methodology. Knowing yourself is the beginning of understanding where your blocks are and where your potential is. 1) Triangles. When there are three people in a relationship, triangles are neither good nor bad. They just are. Triangles sometimes have one person on the outside when the other two are strongly connected, causing tension. We are in triangle relationships and overlapping triangles with everybody in our culture, our family, our business, where we volunteer, our friends. Looking at triangles, just observing the triangles, and understanding how those triangles function can really change how you see what is really going on. 2) Differentiation of Self. This is the basis of Bowen theory: managing self. Strong grounding and personal guiding principles where a person does not depend on the approval of others for decisions. That is a hard one. I want people to like me; I am a pleaser. Ever since I have written my own guiding principles and the guiding principles for my organization, I have been able to function at a much higher level. Each person in a group emotional system thinks for themselves rather than opting into the will of the group. That is what is called group think. Group think is not at all what consensus is. Consensus is accessing the best thinking of everybody in the group, the independent thinking, and then looking for the synergies of that thinking together. Differentiation of self – a very important foundational concept of Bowen systems. 3) Nuclear Family Emotional System. The basic family unit is where we learn patterns of behavior. By observing our family, we learn about ourselves and gain abilities to understand other emotional systems. We are a product of our family. Our family shapes us—our basic concepts of how we should behave and make decisions come from our nuclear family. 4) Family Projection Process. We all inherit problems and strengths from our parents who have projected their fears and their hopes onto us. Observing these patterns frees us to be independent and function in basic self. This one was a game changer for me. I am grateful for what I inherited from my family. I am also an independent decision-maker. Therefore, knowing what I inherited allows me to have the freedom to make my own decisions. 5) Multi-Generational Transmission Process. Another “aha” moment for me. We all possess learned behaviors that have been taught to us knowingly and unknowingly through multiple generations. Response to these emotional triggers results in less differentiation of self. Observing these patterns allows us to make good decisions, staying true to our basic self. Oh my. Studying my family of origin, generations that I did not even know, revealed lots of things to me about myself. Understanding how these arrive in my being through DNA, through other ways – there is a spiritual transmission, I’m sure, and there is a physical DNA transmission. 6) Emotional Cut-Off. This is where we avoid or minimize contact with people with whom we have unresolved tension. Often we establish new relationships as a substitute for the same issues appearing over time. Meanwhile, the tension continues with the original person, creating unresolved anxiety. In part two, I am going to talk about some of the sub-themes of all of these eight concepts. Anxiety is one of those. That is really contagious. Emotional Cut-Off: sometimes it is good to have space from someone. However, when somebody cuts off from us in our family, our company, our charity, our church, our group, it is really difficult to lead. Understanding emotional cut-off and what is really going on there. 7) Sibling Position. Ooh, this was an “aha.” I am the oldest brother of brothers. Bowen continues the research of Walter Tomlin on the patterns of sibling position. Being aware of our position, as well as the position of others in our emotional systems. We show up as we showed up in our family. I show up as the older brother of brothers. I am pretty much out there, making the rules and leading because of that position. That is just knowing myself. 8) Societal Regression, societal emotional process. There are parallel patterns in society and family systems. Observing these patterns of regression and progression can inform us about our personal relationship patterns in families and organizations in general. Being aware of what goes on in society around us and how it moves through the ages is very informative. Now here are some resources if you are interested in learning more about Bowen systems. Georgetown University has the Bowen Center: thebowencenter.org. You can go to Amazon and search Roberta Gilbert. I recommend starting with her book Extraordinary Relationships: A New Way of Thinking About Human Interactions. You can find all of her books and e-books on Amazon. She has written about Bowen systems and put them into systems in her book. There is one called Eight Concepts of Bowen Theory, and the cornerstone concept is the one that talks more about guiding principles. You can’t lose. Any of the books will help you learn about yourself, build your skillsets to know yourself, break through those things that you didn’t know were holding you back. 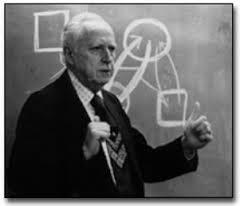 Having studied Bowen’s systems very intently and intentionally for eight years, I highly recommend it. By the way, Roberta Gilbert will be on this series. She is the interview about the legacy of Murray Bowen, starting a series on legacy. Thank you for being here today. Go on iTunes and give me a review. Review my podcast. It would help me share with more people. I’ll see you in Part Two, coming in just two days. *Gilbert, Roberta M. (2011-03-14). Extraordinary Relationships . Leading Systems Press LLC. Kindle Edition. When there are three people in a relationship. Triangles are neither good nor bad – they are. Triangles sometimes have one person on the outside when the other two are strongly connected, causing tension. The basic family unit is where we learn patterns and behaviors. By observing our family, we learn about ourselves and gain abilities to observe other emotional systems. We all inherit problems and strengths from our parents who have projected their fears and hopes on us. Observing these patterns frees us to be independent and function in basic self. We all possess learned behaviors that have been taught to us knowingly and unknowingly through multiple generations. Response to these emotional triggers results in less differentiation of self. Observing these patterns allows us to make good decisions staying true to our basic self. This is where we avoid or minimize contact with people with whom we have unresolved tension. Often, we establish new relationships as a substitute, with the same issues appearing over time. Meanwhile, the tension continues with the original person, creating unresolved anxiety. Bowen continues the research of Walter Toman on the patterns of sibling position. Being aware of our position as well as the position of others in our emotional systems. There are parallel patterns in society and family systems. Observing these patterns of regression and progression can inform us about our personal relationship patterns in families and in organizations.